JFK once said: “Nothing compares to the simple pleasure of a bike ride”. And you know what? 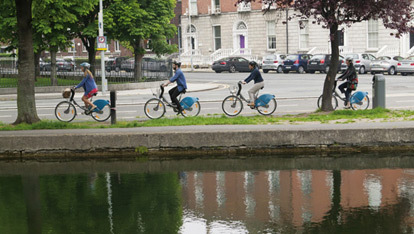 It looks like the people of Ireland agree: cycling here has taken off in a big way – there are cycling clubs all over the island and membership of Cycling Ireland has shot up by 50% over the last three years. Nowhere like Ireland? Rory could well be right, you know. 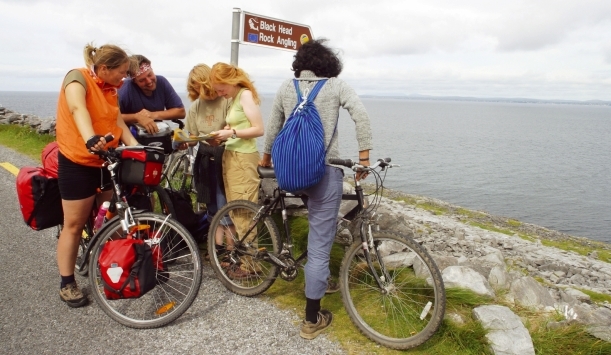 Lonely Planet named County Clare as one of the world’s 10 best cycling routes; and incredible trails, such as the Kingfisher Trail in Northern Ireland and the Great Western Greenway in Mayo, are gaining attention from cyclists of all levels and abilities. Whether you’re mixing top views with steep ascents along south Dublin’s twisting Vico Road, home to Bono and Enya, or taking it easy alongside the green fields of Counties Tyrone or Offaly, you don’t need bulging calf muscles and flourescent Lycra to enjoy the best routes on the island. If flat terrain is what you’re after, try Roscommon or Leitrim (the latter got its first set of traffic lights in 2003). If you’re into a challenge, hit the Glens of Antrim or Connemara’s Twelve Bens for more undulating terrain. So what makes Ireland different? Some believe it’s the off-the-beaten-track nature of some of our roads, which are dotted with wandering sheep, lost goats and the odd tractor. Others say it’s because we’re a small island and you can cover a huge variety of landscapes in no time at all, going from rust-coloured bog to white-sandy beach in less than an hour.